Sidoine Benoît was a Benedictine monk of the 14th Century at the Abbaye-aux-Hommes in Caen, in the Calvados département in the Basse-Normandie region of France. He is credited with inventing the dish Tripes à la mode de Caen. It was the use of cider and apple brandy in food that was Benoît's inspiration and contribution to French cuisine, making the insipid tripe dishes of the monks palatable. 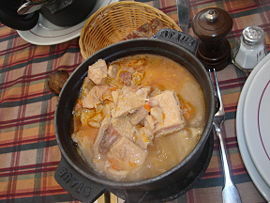 In its original form this dish consisted of all four chambers of a cow's stomach, part of the large intestine (this was outlawed in France in 1996), plus the hoofs and bones, cut up and placed on a bed of carrots, onions, leaks, garlic, cloves, peppercorns, a bouquet garni, a bottle of cider and a glass of calvados in a tripière (a special earthenware pot for cooking tripe). Some sources include a large quantity of blanched beef fat. This was covered and hermetically sealed with dough and simmered in the oven for fifteen hours. The hoofs, bones and bouquet garni are removed before serving with a sprinkling of some more cider. Although this dish is prepared in Normandy throughout the year, locals believe that the dish is best in Autumn when the apple trees are bearing. Some of the fruit falls to the ground and is eaten by the cattle, along with the rich grasses of the season, imparting a distinctive flavour to the animal. Although legend has it that William the Conqueror, Normandy's most famous notable, enjoyed this dish, he and Benoît were not even close contemporaries making this probably no more than a fable.